You may have noticed by now that I am a huge coffee addict. Whether its a cup of hot coffee in the morning, iced coffee on a hot day, or chocolate covered espresso beans, I have a hard time resisting. 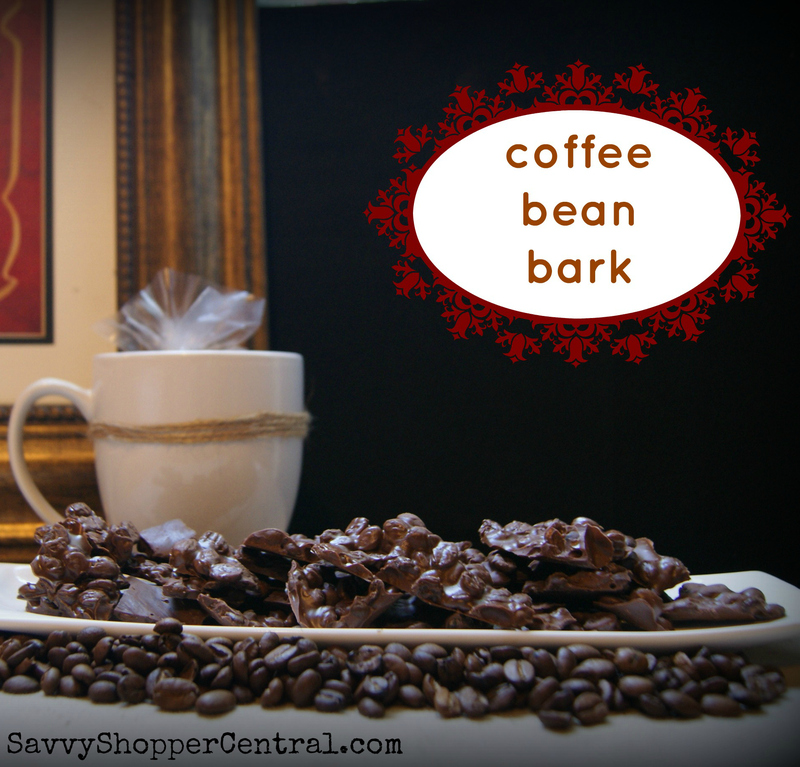 Needless to say, I fell in love with this Coffee Bean Bark. Chocolate & coffee – 2 of my favorite things! Now, this isn't for the decaf drinkers out there. Rather this is a hide it from the children and try to limit yourself type of treat. Like all barks, it also makes a great gift. Place a little bit of bark into a cellophane, tie it with some raffia, and put it in a cute coffee mug from your local dollar store. Attach the following warning label & you have a great gift for your favorite coffee lover. Start by spreading coffee beans on a parchment paper lined cookie sheet. Roast beans in oven for 8-10 minutes. Melt chocolate in a microwave safe dish for 30 seconds at a time- stirring each time. Pour roasted beans into bowl and stir to coat them all. Using the back of said spoon spread over parchment lined baking sheet. You can either let it set for several hours or if you are impatient put it in the freezer for about a half an hour. When bark has set, break into SMALL pieces and place in bags. Oh my! Looks so good!!! I need to make some for a few of my close friends. If it has coffee in the recipe I love it! Thanks so much for sharing with Full Plate Thursday and have a very Merry Christmas!